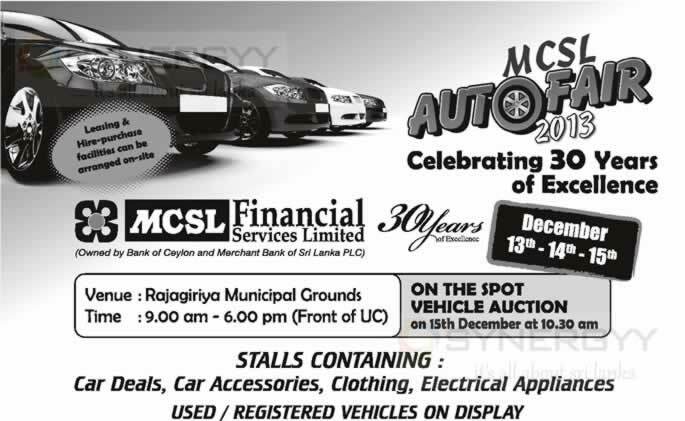 Suzuki Motors Lanka Limited is an authorized distributor of the Suzuki motor cycles in Sri Lanka offer below range of motor cycles in Sri Lanka. Suzuki Motor bike prices are starting from Rs. 224,900/- to Rs. 392,900/-. All above prices are all inclusive, for more details see below image or Click above links to see each and every specification of individual motor cycles. 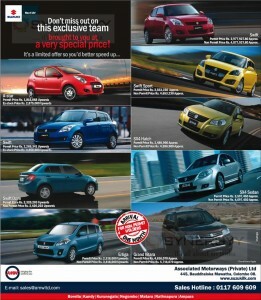 Suzuki Motors Lanka introducing Indian Made Japan Technology Suzuki motor cycles in Sri Lanka from Rs. 376,900/- upwards. With All new features Gixxer SF SP (Special) is designed to set your heartbeat Racing. From matt finish design to stylish graphics, the all new Gixxer SF SP is loaded with exciting new features. 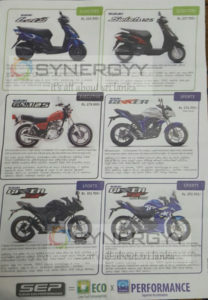 So, get ready to race yourself with Gixxer SF SP. The premium looking Suzuki Gixxer SF is a fully faired 155cc motorcycle which has been developed in the same wind-tunnel where the legendary Hayabusa, GSX-R and MotoGP machines are developed. The fairing has been designed to give maximum wind protection to the rider, reducing turbulence and drag, thereby delivering great aerodynamic efficiency. Every feature of the new Gixxer SF is designed to give a sporty and premium look – from its futuristic-looking aluminum exhaust end cover, new clear lens indicators and pinstripe on the wheels gives it a sharp & edgy look, guaranteed to appeal to all motorcycle lovers! Coupled with a five-speed gearbox provides exceptional running performance with a broad low-end torque and dynamic mid-range power for strong acceleration which gives riders a thrilling and superb ride! The New Gixxer SF is here to set your pulse again. With its additional features, it’ll surely give a new meaning to your love for racing. Not to forget, this great performer comes from the Gixxer Family which boasts of winning multiple awards. So why wait, the streets await you. Here is the latest version of your favourite street sport bike. With its new advanced Rear Disc-Brake, it promises a really fabulous, more stable and more confident riding experience on every road. 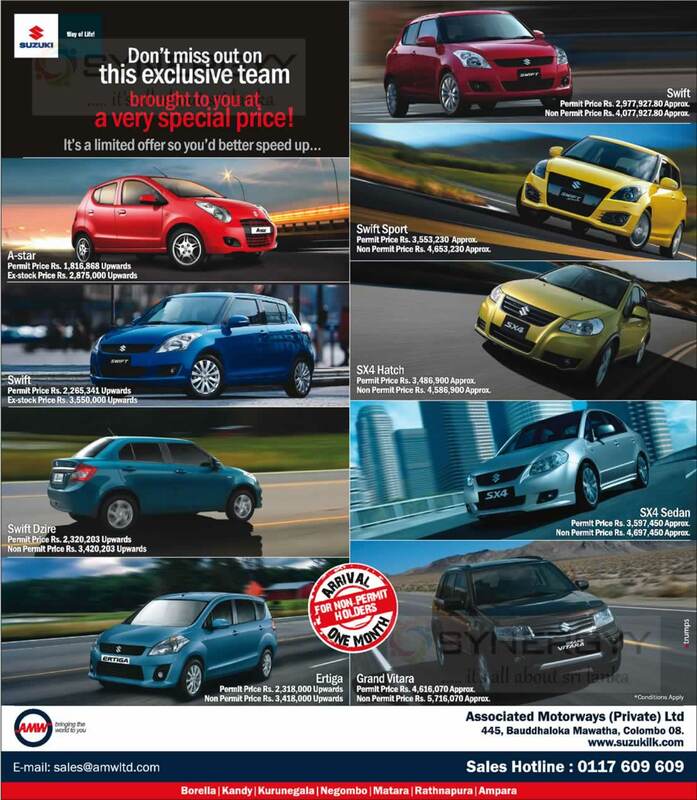 In fact, it comes loaded with many world-class features to make your rides suberbly exciting! Get ready to live the dual-tone excitement with the Suzuki Gixxer. Flaunt your unmatched style with its fascinating new colour combinations – Green/Black, Blue/White and Black/Red, which are inspired by Suzuki’s traditional racing colours. These three cool shades will surely add more thrill and joy to your street sport biking experience. You’d also love this stylish dual-tone performer for its amazingly powerful and ultra-light 155cc engine with Suzuki’s Eco Performance (SEP) technology, a wide array of cutting-edge features and a powerful chassis developed by the engineers who designed the legendary GSX-R series. It promises a distinct biking experience with its sharp torque and dynamic mid-range power that ensure better acceleration and sporty handling. So why wait? Make a brand-new dual-tone style statement with India’s most admired street sport bike. Suzuki Motors Lanka introducing Indian Made Japan Technology Suzuki Scooters of Suzuki Swish 125 and Suzuki Lets in Sri Lanka. 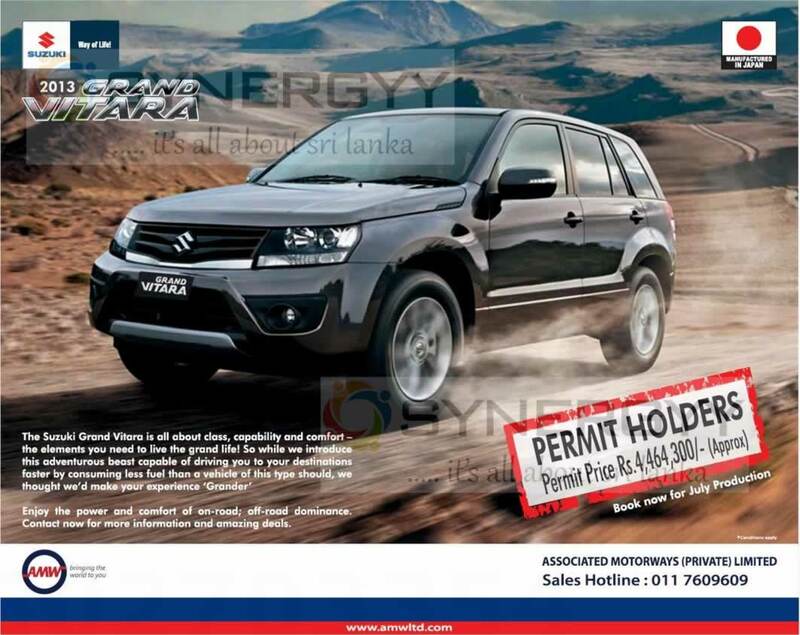 Enjoy a hassle-free leasing solution on any Suzuki motor vehicle for State Sector employees (with/without duty free permits) and private sector executives. The AMW Capital leasing is specially arranged for a help to the AMW clients who wish to buy their dreams cars, van, SUV and motor bikes from Nissan, Maruti Suzuki, Yamaha and so on. 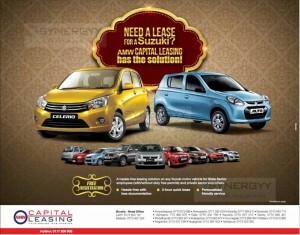 AMW Capital leasing offers you a hassle-free with less documentation proceeds within 3-hour and it is guaranteed a personalised, friendly service. 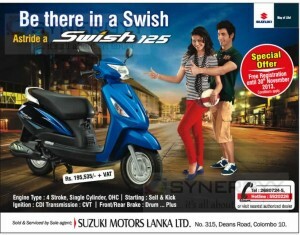 The Suzuki Motors Lanka Limited introduces the Suzuki Swish 125 in Sri Lanka for Rs. 195,535.00 + Vat of 12%. 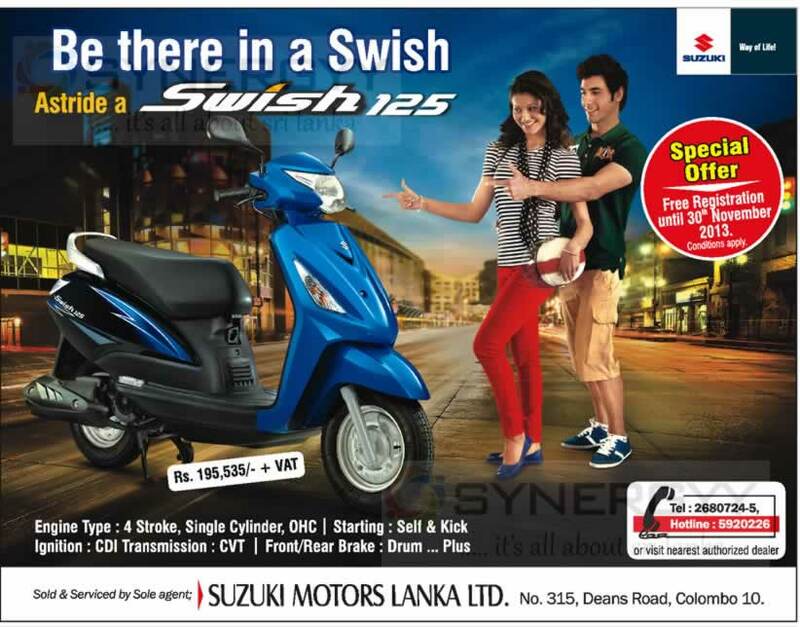 The Suzuki Swish 125 is with 4 Stroke, Single Cylinder, OHC, Self & Kick Starts Options,and Front/Rear drum Brake. 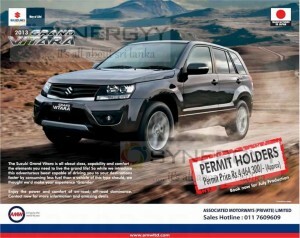 The Suzuki automobiles are the most selling Automobiles in Srilanka with Japanese technology with much more comforts. 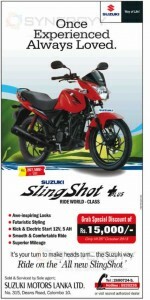 Suzuki Motors Lanka introduce Suzuki Sling Shot in Sri Lanka for Rs. 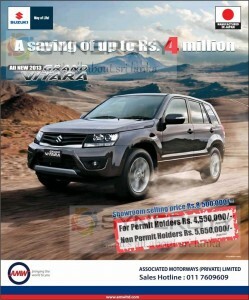 267,500.00 + VAT (Rs. 299,600.00 all Inclusive). 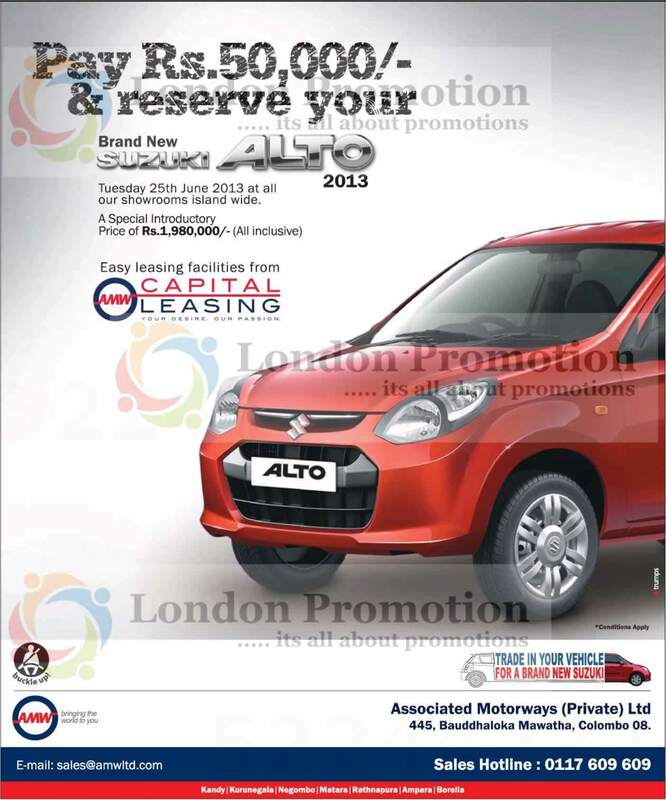 Purchases before 25th October 2013 and enjoy a Special Discount of Rs. 15,000.00. 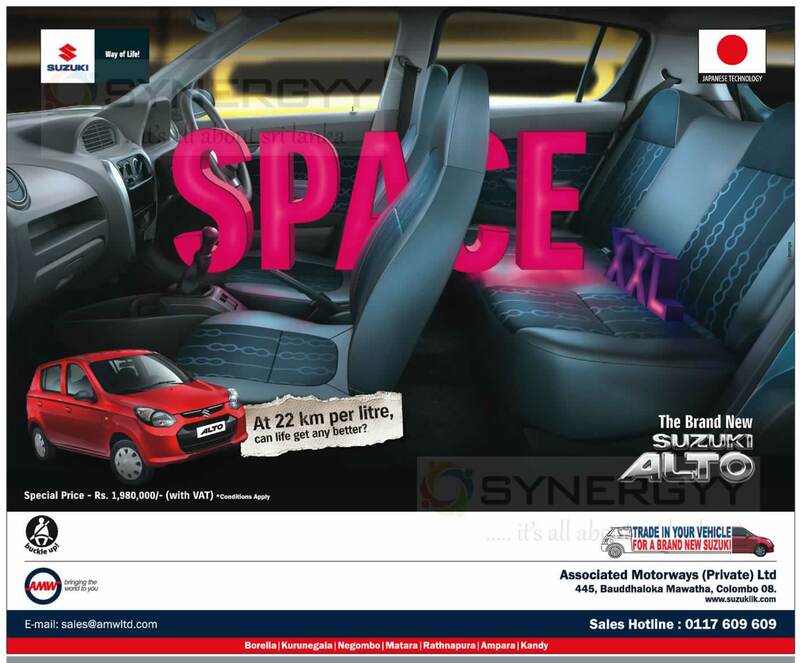 Now enjoys the mileage of 22 km per liter only on Suzuki Alto from Associate Motor Ways (Pvt) Ltd in Colombo, the Maruti Suzuki Alto now available in Sri Lanka for Rs. 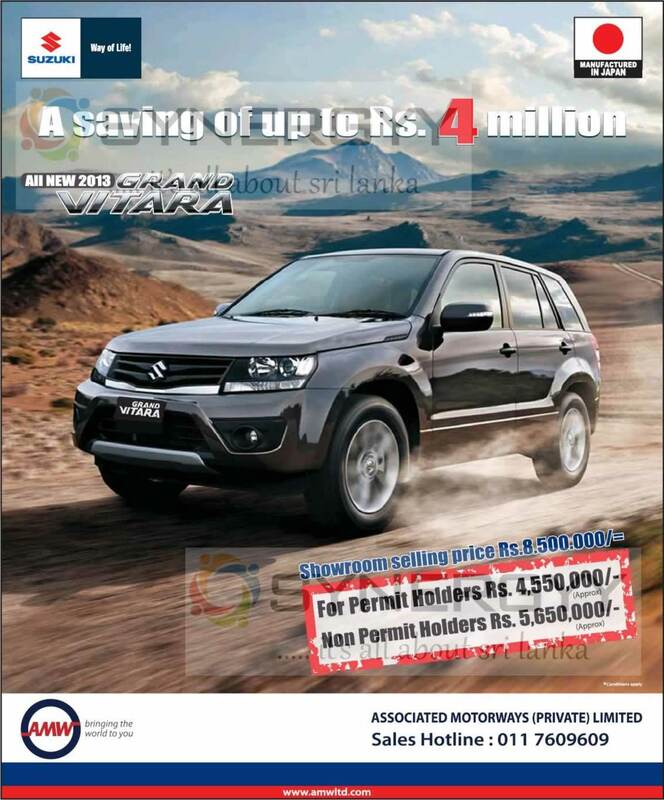 2,292,000.00 (With VAT). Free insurance facilities for one year, those who are obtain LB Finance within the offer period and the offer valid till stock available. 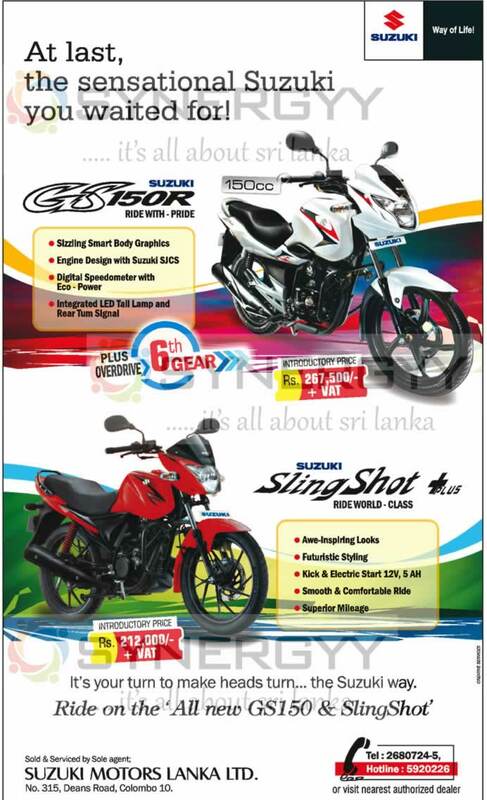 Experience the Japan Technology and Indian Economical efficiency with Suzuki Sling Shot Plus in Sri Lanka, the Suzuki Motors Lanka introduced its Premier Motorcycle of Suzuki Sling Shot Plus in Sri Lanka with Rs. 212,000 + VAT. 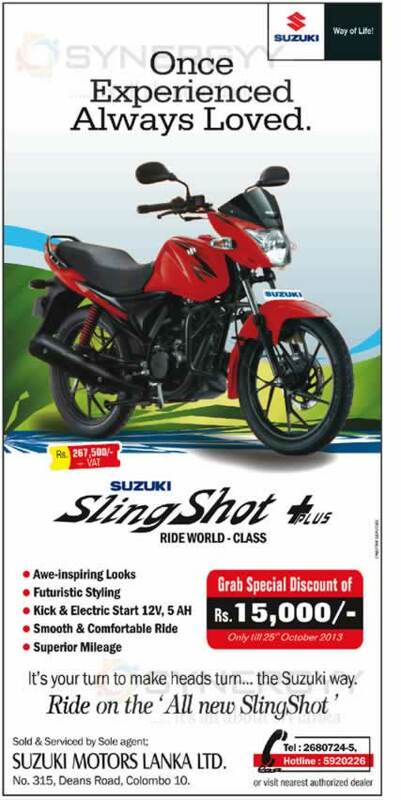 The Suzuki Sling Shot Plus with features of Awe-inspiring Looks, Futuristic Styling, Kick & Electric Start 12V, 5 AH, Smooth & Comfortable Ride and Superior Mileage. The Suzuki Motors Lanka Ltd introduce Suzuki Motorcycles in Srilanka with best selling models of Suzuki GS 150R and Suzuki Sling Shot Plus. 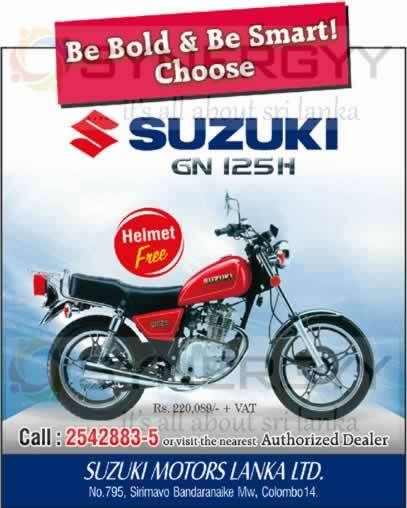 Buy your bold and be smart motorbike from Suzuki Motors Lanka Ltd of Suzuki GN125H at Rs 279,900/- with VAT with a Free Helmet. Landing on Srilankan soil for the first time, this affordable 7 seat wonder vehicle is ready to take you on journeys to places you have always wanted to go or wish to return to. 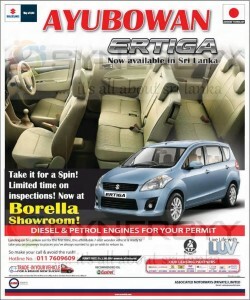 The AMW announces the special offer price for the Suzuki Ertiga as Rs. 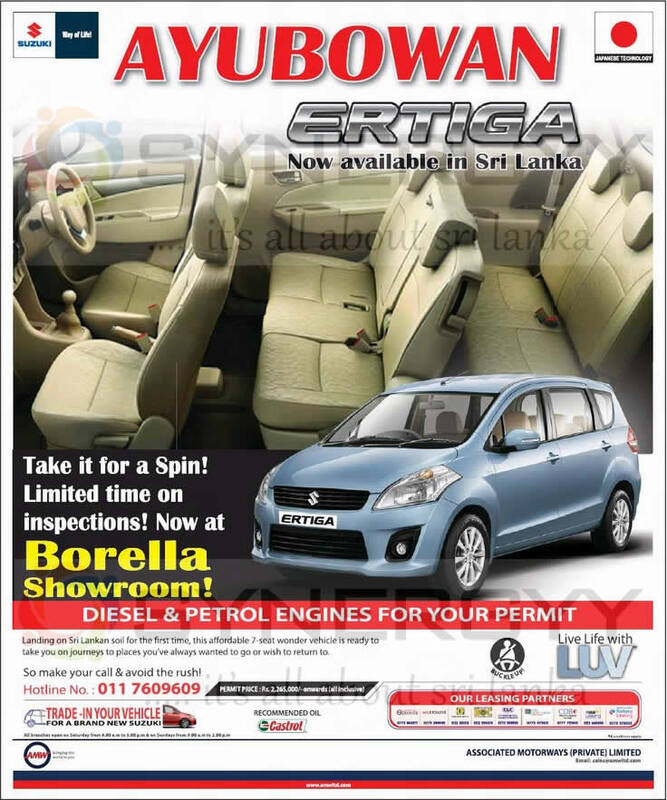 2,265,000 for Permit Holders, visit to AMW Borella Showroom and Inspect your Suzuki Ertiga today. 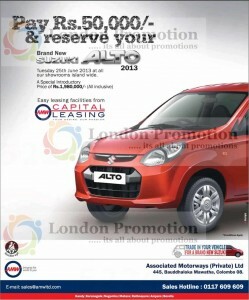 Your very own car is ready and waiting. 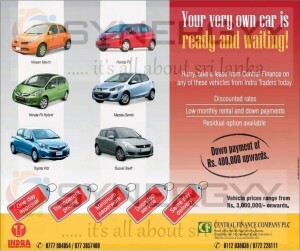 Hurry; take lease from Central Finance on any of these vehicles from Indra Traders today with Initial Down payment of Rs. 400,000 Upwards. 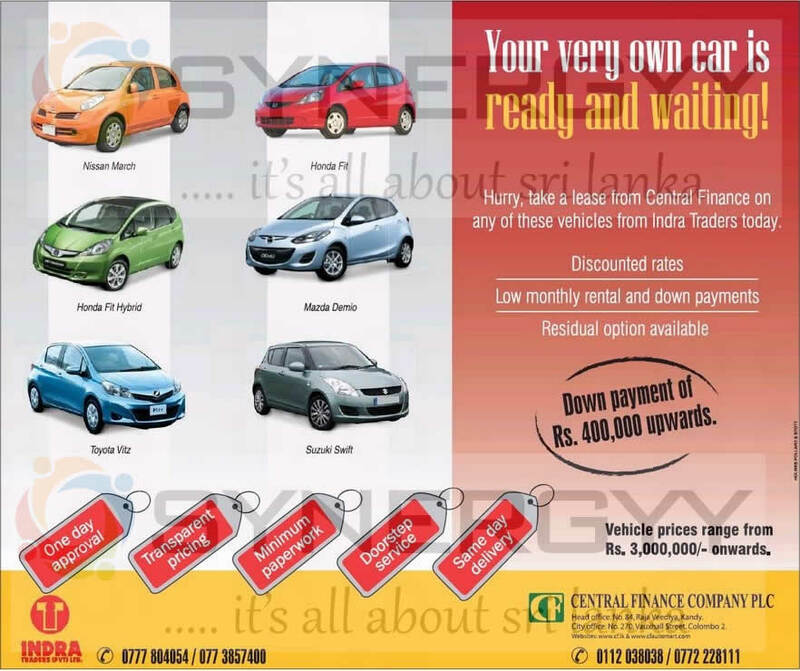 The Joint Benefits from Central Finance and Indra Traders are to enjoy a discounted rate with low monthly rentals and down payments with Residual option. Suzuki Motors Lanka offers Suzuki GN 125 for Rs.279,900.00 + VAT in Srilanka, secure a branded motorbike with safe journey. No. 795, Sirimavo Bandaranake Mw, Colombo 14. 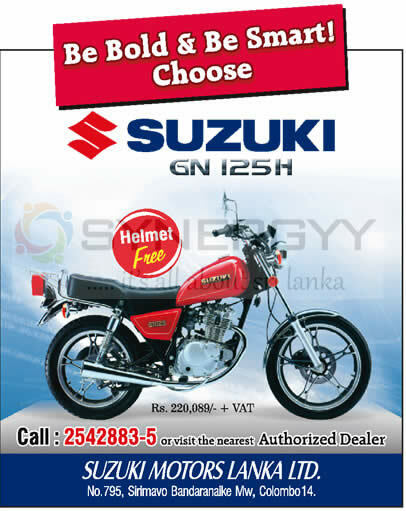 Suzuki Motors Lanka offers you an excellence performance Suzuki GN 125 to be bold & be Smart. buy your Suzuki GN 125 H for Rs. 279,900.00 + VAT.